Click on "More Details" to book this seat! …32J. Here you’ll find a cozier but still spacious layout. The generous recline means that some of your extended head space is eaten up and can also make it a little bit harder to crawl over sleeping neighbors. The power/charging outlets are in a much better place here though. Plugging in your devices is easier to explain when everyone can see what you’re doing. You’ll also have a moveable armrest between seats so you can spread out a little if by miracle the middle seat is open. This seat loses a tidbit for lack of window-to-aisle convenience, but makes up for it with little things like slightly greater width, moveable armrests and more accessible amenities. Looks like the meal they shellack and put into the display case. 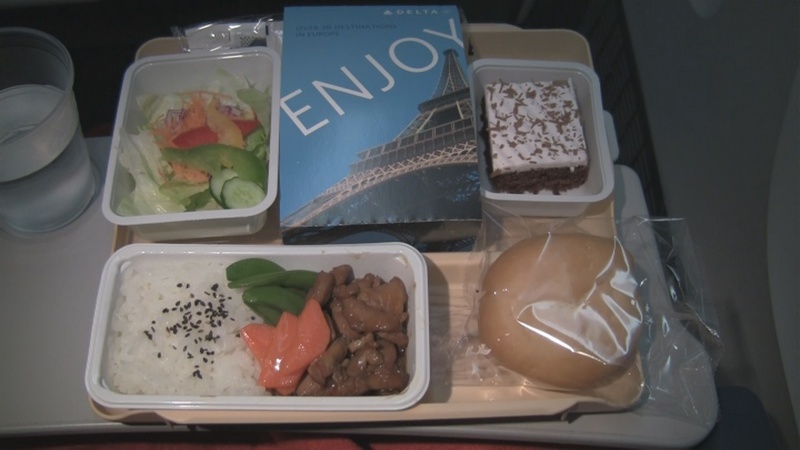 But no, it’s just a very shiny economy class meal. Food: Delta usually surprises me with food (in a good way) and this was no exception. All the dishes shown in the video review were at minimum just slightly better than average economy meals in regards to flavor. I should note that Economy Comfort passengers get the same meal service as in (normal) economy. Summary:. 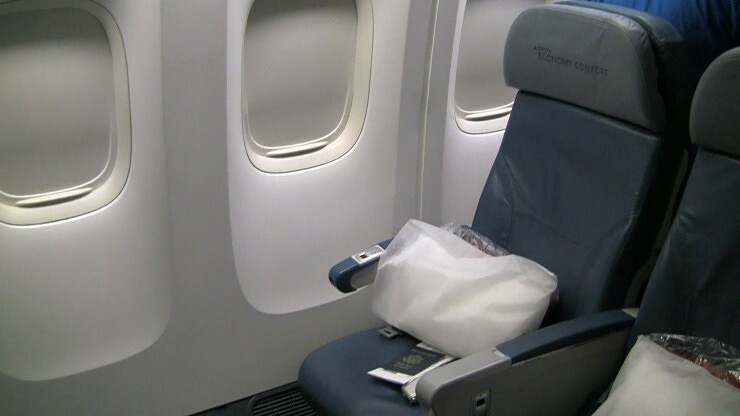 Book economy comfort seating on longer flights if you absolutely need the extra legroom. Prices vary depending on your elite status with Delta but base prices were still pretty reasonable at the time of this review (May 2012). If you plan on trying to sleep you should appreciate the recline of any seat in this cabin but if you need that little extra bit of stretch room, opt for the bulkhead if it’s open. This is still an economy seat so don’t expect anything but economy service, but after you down a complimentary gin & tonic (or two), the extra recline should make it much easier to zonk out for a bit. Strategy: If you’re the paying type, the prices are pretty reasonable for the long routes these planes fly and are offered for purchase when selecting your seat at Delta’s website. Alternately, you could do your best to find a gate agent who’s sympathetic to your stories of back pain and early meetings…Just remember, they hear these stories every day. time to arrival 44 hours 44 minutes? Actually, it displayed 44:44 for the entire flight. This looks like a newer version of Delta’s IFE software, so maybe just working out the kinks. Hi Tim. Economy comfort seating in general should be similar but Delta operates several different versions of the 757 so each may have slight differences. If you know which of the many configurations you’re on, you can check seatguru.com and see what they have to say. If I were to give general advice I’d say stay away from bulkhead seats if you’re near a lavatory as people tend to congregate in your space. Let us know how it goes! Correct me if I am wrong, but in my experience EC seats on DAL always offer complimentary spirits, so paying for the gin and tonic wouldn’t have been necessary. Hi Mark – You’re absolutely right. Drinks are indeed complimentary on International Delta flights in Economy Comfort (Still a charge on drinks aboard domestic US flights). I changed the text review to reflect the correct info. – Thanks! Hello there Jake: You mentioned power location, but in my travels in F or C (as I’m sure you’ve encountered, too) there’s always someone who’s in dire need of locating the power port and it’s a coin toss if flight attendants can help, especially if the port needs to be reset. So my question is, ever consider photo-ing the actual location of the power ports? I’ve never seen an online resource (even like Seatguru.com, etc.) that will say more than if power ports should be available in certain seats; forget about an actual location or status to assist those who really “think” they need power. Or do most travelers — myself included — just really never need power that urgently? Hey dkMOMUS! I try to mention it in the videos but maybe it’ll be helpful if I give a little more detail. I’ll keep that in mind for future videos/posts. Could be pretty useful! Hi Jake, Thanks for the great review. Could you please tell me if there were any baby bassinets on the bulkhead at Row 31? Thanks! Delta doesn’t provide good information on providing bassinets but I’ve been told by a trusted source that there are indeed positions in the first row of economy comfort aboard all configurations of this aircraft. That said, I’d still recommend calling Delta to make certain there would be one available to you. Hi Jake! Would you happen to know whether you were flying on the 777-200LR or the 200ER? Do you know of any differences in the EC sections of the two aircraft? I’m flying the 77L froom LAX to ATL soon, and I’m considering your review in determining whether to upgrade or not. Thanks! Hi Julio. This was a 777-200ER. To the best of my knowledge (please, anyone step in and correct me if I’m wrong) the Economy Comfort sections are identical on both the ER and the LR. Thanks a lot for the info. Really helpful. Could you tell me if the armrests in the buckhead row could be lifted up? I am thinking if there is no one sits next to me, I can lie down? Maybe that is wishful thinking. Wonder if you have ever seen planes that empty. Thanks. You have provided an “invaluable” service and for that I am grateful. PLEASE keep them coming. Thank You, I appreciate the compliment. Cheers! I just flew the same route from NRT-SIN in seat 44A. I like the exit rows because I am 6’2″. The down side to this seat is the lack of legroom due to the emergency exit door. I was fortunate that no one else was sitting in my row, so I moved to 44C, a much better choice for us tall guys. Those exit doors can be a doosy. I was just back aboard a KLM 747-400 combi and was reminded of how bulky the exit slide compartments attached to the door were. Thanks for the review. I love the video! Very informative. Quick question though, I have a choice between either exit row window or an aisle bulkhead economy comfort on the same plane. I’m flying LAX to Sydney. I haven’t flown economy comfort yet internationally and have instead always gone for the exit row window so I can prop my head up. I’m small, so the issue with the exit door in front of me is not a problem. In your experience, do you think there’s more recline to actually lay back somewhat compared to the exit row seats? I’m just wondering which seat would be more comfortable. Thanks for any insight you can offer! I personally prefer the aisle but know that having the wall to sleep on is a nice perk on long flights. If that’s what you’re used to, then it might be a good thing to stick to. The extra recline in Economy Comfort is certainly nice but I can still see a benefit in being able to lean against the wall for sleep. 31J offers both, which was great. Great, thanks so much for the advice. I would have loved to get 31J, but unfortunately it was already taken. Thanks!